Looking for a kids music class in West Philly? You found it. This season — nominally the “spring” season, though we’re starting well before spring — we’re going to travel musically all the way around Western Europe and the Nordic countries. In addition to being home to some of the greatest composers of all time (Beethoven, Bach, Mozart, Lennon and McCartney…) Western Europe and the Nordic countries originated and nourished their own local and regional musical forms, from foot-stomping Irish-Celtic dance to Swedish hambo-polka, from mesmerizing Spanish flamenco to mystifying Finnish Sámi voik, from bounding German oom-pah to passionate Portuguese fado, from Basque trikitrixa to the multi-facted Ottoman-influenced sound of Greece. Here are the countries we’ll be visiting. Here are the songs we’ll be singing. The current season of All Around This World will run until the beinning of May. All classes take place at 44th and Pine except the babies-only class on Thursdays at noon, which meets at the Nesting House. Here are the current class times. — Thursdays NOON: BABIES ONLY, generally one year and under (not confidently walking yet). THIS CLASS TAKES PLACE AT THE NESTING HOUSE, at the corner of 45th and Baltimore. E-mail or call 215-913-2679 with any questions. How much will these wonderful classes cost me? 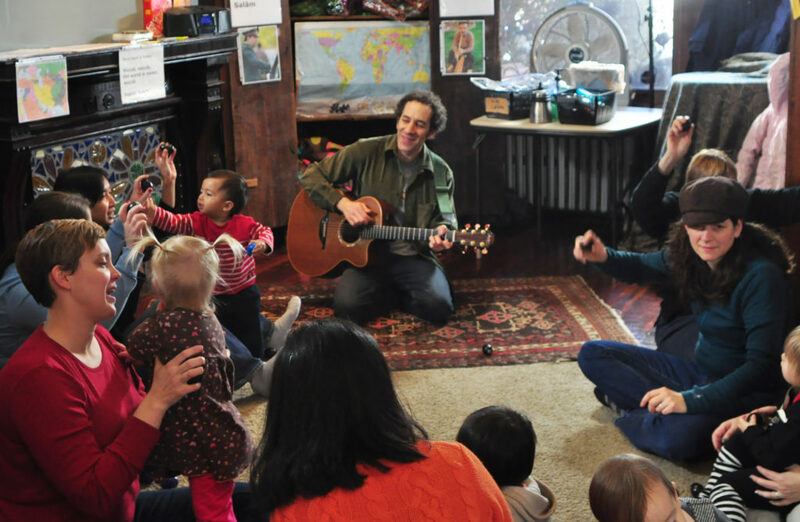 Regular registration for Wednesday All Around This World kids music class in West Philly costs $175 for each season of 11 weekly, 45 minute long parent/child classes. Saturday students pay $170 for class by buying a “10 class card” — you buy a card, I mark a class off each time you come. That way with my sporadic Saturday schedule and with yours, when you “miss” a class you really won’t be missing a class. For Wednesdays first sibling: $136 (a 20% discount). Many discounts and scholarships are available at the West Philly location! (Look at the list below.) Do you have a playgroup or other group that would sign up together? If so you can get a great deal. If these discounts still don’t make the cut, ask me about the “pay what you can” plan. Contact me and let me know you’re interested. I’ll be very happy about that, and will get back to you soon. Many Discounts for the All Around this World’s kids music class in West Philly! All Around This World wants to support positive community work in West Philadelphia and beyond! Check the list below to see if you qualify for a 10% discount. Do you have solar panels? You get a discount. Do you have a green roof or a rooftop garden? You get a discount. Do you have an active plot in a community garden? Discount…. Do you volunteer at Mill Creek Farm or for Preston’s Paradise? Do you take classes at the University City Arts League, Studio 34 or Scribe Video? Are you a member of the Mariposa co-op or Weaver’s Way? Do you live in an LCA house? Are you involved with any of the community, cultural or religious groups that have a home base at the Calvary Center? Do you organize with the A-Space or the LAVA space? Are you a member of the Friends of Clark Park? Do you volunteer with UC Green? Do you have a child in Jacqueline Unanue’s holistic art program? Do you home school or unschool? Are you a part of the West Philly pre-school co-op? Are you a member of the West Philly Tool Library? Are you involved with the Sustainable Business Network? Does your child go to the Jubilee school? Are you an organizer with WPEB 88.1, Neighborhood Bike Works, Spiral Q, the Human Rights Coalition, StopMAX, Books Through Bars, Geoclan, ACT-UP Philly, the Young Broadcasters of America, Food Not Bombs, the Philadelphia Independent Media Center or the Media Mobilizing Project? Are you active in the Spruce Hill Neighborhood Association, Cedar Park neighbors or your local neighborhood assoction? Are you part of the 52nd Street Business Association? Do you volunteer with or do work with We Never Say Never or the People’s Emergency Center? If you’re involved in any positive community work that’s not listed here, let me know. Your 10% discount applies to all children in your family who you enroll in class. Limit: 10% off, even if answer yes to more than one of the above questions. Do you want your child to attend All Around This World’s kids music class in West Philly but you really can’t afford it? Contact me and we’ll work something out.